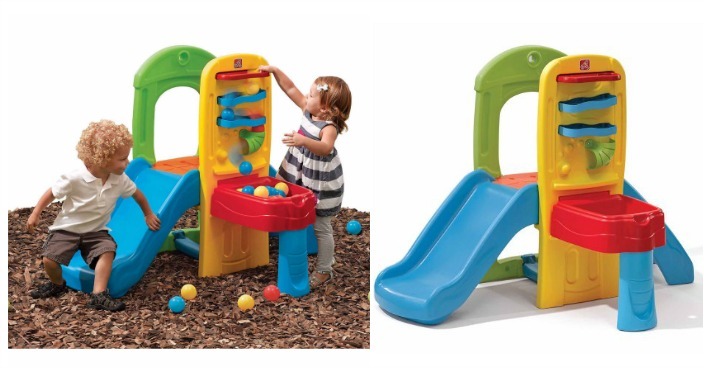 Step2 Play Ball Fun Climber Just $63.99! Down From $88! You are here: Home / Great Deals / Christmas Deals / Step2 Play Ball Fun Climber Just $63.99! Down From $88! Right now you can get this Step2 Play Ball Fun Climber for just $63.99 (Reg. $88) at Walmart! Children will enjoy themselves all day long with the Step2 Play Ball Fun Climber. It features a built-in crawl thru space underneath for kids to scurry through with their friends. A zig-zag maze on the side allows for balls to drop in and into the pit. This Step2 climber also comes with a slide and ladder for children to step onto. It includes 10 play balls, but will accommodate any standard size that are suitable for young children. This slide climber allows your little one to play and explore all in one place. You’re able to put it up wherever you’d like the children to play thanks to its easy setup and takedown. This fun climber is made for the outdoors, but can also be used indoors.